After what seems like a very long January, our in-house analysts have been busy churning out almost 200 reports, covering hundreds of shows and some! From extreme utility to Pokémon-themed hoodies, here are the top trends reflected on the runway – and what it means for your Fall assortment. 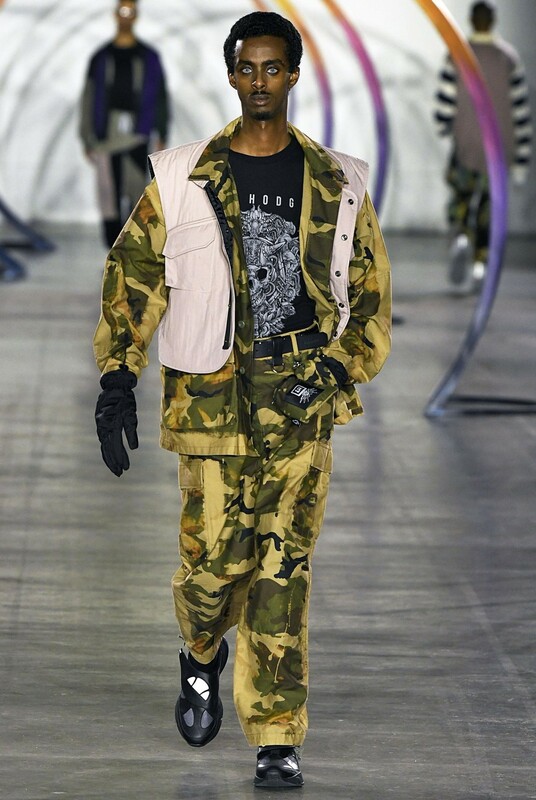 A timely reissue of advanced utility from the likes of Prada, Liam Hodges, and Christopher Raeburn all merging functionality with military inspiration. And yes, cargo is still trending. Cargo pants were a top-moving style in both US and UK luxury market in January; we expect this will influence successful styles in the mass and value markets. In the past three months, we’ve spotted a 27% increase of new in cargo jackets in the UK & US combined. Alongside cargo, technical outerwear, utility vests, and backpacks are all key to nailing this uniform. However, don’t forget, the devil is in the (functional) details – we can’t get enough straps, toggles, patch, and zipper pockets! Check out the below graph analyzing the full price of technical jackets stocked within the past month in the UK mass market. We can see majority of these brands are operating within the £40-60 price bracket. The utility trend provides opportunity to push higher price outerwear within your Fall/Winter assortment as technical fabrics with wind-proof or moisture wicking features are a must. Nothing says ‘sports meet street’ like a bumbag AND a pair of sneakers swathed around your waist in unison. MSGM were among the many designers taking their cues from street style this season as puffer jackets, track pants, football shirts, and scarves stormed the runway. When incorporating this theme into your assortment, look towards bolds and neons as both solid or highlight colors. Take note of features such as side stripes, half-zips, and varsity detail to give non-performance products a subtle nod to sportswear. Timing is everything on seasonal items such as the puffer jacket. So it’s essential to get your phasing right to ensure you’re not lagging behind your competitors. Lucky you! We have a tool that helps you understand the best time to drop products *wink*. Looking at new arrivals in the UK and US over the past 18 months, July is when this trend starts gaining momentum, hitting its peak in October. With harsh winters here and Mother Nature releasing the polar vortex on us, keep this graph in mind when planning your heavy outerwear items drops. Appearing in Off-White and Wooyoungmi, the half-zipper was a standout feature in jersey tops on the runway – lending an instant sporty update to your basics offering. By analyzing new styles arriving in the mass market over the past three months, we’ve clocked an 80% increase in the UK and a 53% increase YoY of tops categories featuring this detail. This increase was driven by knitwear, hoodies and sweats. While half-zip details are starting to appear on funnel neck sweaters in the UK, this trend is yet to resonate in the US retail market. Based on their runway presence, we can expect to see half-zip polo shirts trickle into transeasonal assortments. Checks were the most noteworthy print across all cities and favored in houndstooth, windowpane, as well as oversized checks as a nod to the grunge trend. The versatile print was strong across both suiting and athleisure – representing 20% of new printed arrivals in the UK mass market and 14% in the US in the past month. Logomania took a backseat this season as statements and graphics reigned supreme. Bobby Abley hit us right in the childhood with Pokémon-themed hoodies, tracksuits, and accessories while on a darker note, UNDERCOVER embraced the ultra-violence with A Clockwork Orange graphics. Perfect for teen & tween market, as well as merchandising for festival stories. Graphic prints made up 26% UK and 36% US of new printed arrivals in the past month. Animal print is a continuing trend for Fall 2019. We, uh, spotted this pattern on outerwear pieces at the likes of MSGM, Versace, Marni, and Raf Simons. Leopard print was most dominant in the luxury and mass market, making up 20% of animal prints retailing across the UK and US. For a solid alternative, look to tiger stripes. Snakeskin was also a key print which plays in nicely on the prominent Western trend. So that’s a wrap, folks! What a month it’s been, full of comebacks and firsts. To find out the commercial trends from all four cities, head over to our Menswear Fall 2019 page, where you’ll find all runway coverage reports. In them, you’ll get insights into key colors, themes, prints and more compiled by our analysts. And if you have EDITED access, you can log in here to read the full reports. Research and data insights by Kayla Marci, Market Analyst.